A collection of Modern Primitives. These are objects that are simple enough for prototyping and fancy enough for your final build. Shapes with no purpose but the ones you give them. These could be: the mysterious Orbs of Lerp hidden in the dark depths of a dungeon for hundreds of years, the power cell for a Uranium 238 Modulator, an ornate Power-Up. 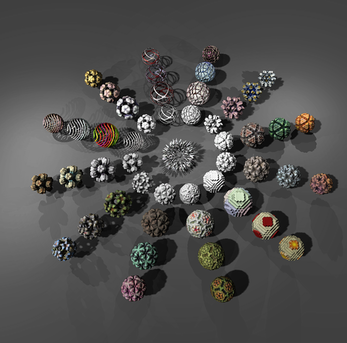 This package includes 13 shapes – roughly spherical but unique in geometry and detail. Each includes an Ambient Occlusion map and three custom paint jobs that bring out the details of that object. Like my Fractal Flora collection, many of these shapes are created using 3D fractal math.